You are here: Home / Ethnic Groups / The People of Sumatra / Who are the Kikim? The Kikim people group live in South Sumatra province. 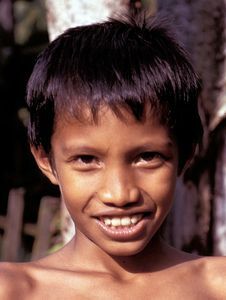 The Kikim are generally the only people group in their area, but there are a few areas with a small number of Javanese as well. In Tebing Tinggi, the Kikim live beside the Lintang, Javanese, Sundanese, and Saling (Lembak) people. In Lahat, the Kikim live near the Lematang people, Javanese, and Sundanese. In the western Kikim area, most of the Kikim are rice farmers. The type of rice planted only takes 6-7 months until it is ready for harvest. They can grow rice twice a year because their water needs are supplied from the small rivers nearby. In the eastern Kikim area, rubber is the Kikim’s main cash crop, with rice as an additional crop grown between the rubber trees. When the rubber trees become mature, rice can no longer be grown in that field. Rice is important for basic dietary needs, while sales from the rubber plant products provide income for other food and living costs. Many people in the Kikim community have chosen to plant rubber trees because the income can be used to pay for daily living costs. On average, they each have one hectare of land. One interesting characteristic of the Kikim people is that they are not very hard working when living in their hometowns, but become more diligent when they work in other places. They concentrate their efforts on earning money. They do not do this in their hometown. The Kikim are known as followers of Islam. Muslims believe that they will be judged based on their knowledge of the Qur’an (their holy book) and on their deeds. Besides these beliefs, remnants of their old animistic beliefs are still seen in the Kikim’s lives. The Kikim are known for a traditional ceremony called Sedekah Rame, where the whole village eats a ceremonial meal together while sitting in a place called the Tanah Badahe Setue (Future Burial Ground) in the middle of the rice fields. That place is set aside as a place for burning incense, presenting ritual offerings to spirits, and lighting bonfires. The Kikim need a better system for field irrigation. Currently, their farming very much depends on rain even though there are small rivers coming from the Bukit Barisan mountains that can be utilized. Also, their manufacturing activities are still at the level of small scale home production. This needs to be improved and expanded to supplement their income. Their pattern of moving often makes it difficult for these farmers to be formally educated. Those that have access to education must deal with an under-funded educational system with inadequate infrastructure. Many school buildings are in poor repair, and there are not enough teachers. Many children do not go to school or have dropped out. Many Kikim children also suffer from malnutrition.